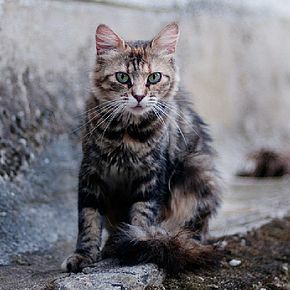 You may be accustomed to using these terms interchangeably, but feral cats and stray cats are actually very different. A feral cat was lost or abandoned and has reverted to a wild state, or was born to a stray or feral mother and has had little or no human contact. These cats cannot cohabitate with people. They live in families or groups called colonies that form near a source of food and shelter. A feral cat is silent, will not approach humans and will generally only be seen from dusk to dawn. He is very adaptable and generally well-groomed. 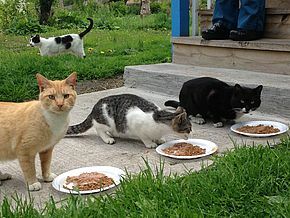 If you put food down, feral cats will wait until you move away before approaching the food. Sometimes feral kittens up to 8 to 10 weeks of age can be socialized and adopted into homes. A stray cat was once a pet. He can be re-socialized and adopted. A stray cat is likely to approach you, although not close enough for you to touch him. If you put food down, a stray cat will likely start to eat right away. He is often vocal—sometimes talking insistently—and may look disheveled, as if he is unaccustomed to dealing with the conditions of the street. A stray can be seen at all times of the day. You may also have heard the term community cat, which encompasses all outdoor cats - both feral and stray. 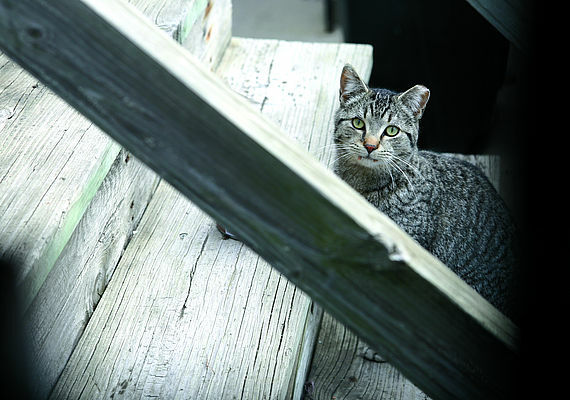 Learn more about PAWS Chicago’s efforts to curb cat overpopulation.